We’ve all heard the constant chorus of central bank bashing. The ridicule comes from a diverse crowd, ranging from retail Joe Schmoes to prominent hedge fund managers… and I admit, Fed economists make for easy targets. But I figured some of you may want to know; Is this rancor justified… or are central banks just a popular scapegoat for traders who’ve continuously been on the wrong side of markets? My answer is… yes and no. Helpful, right? Don’t worry, I’ll explain. And lucky for us, to properly explain my answer we need to explore the central bank/market relationship. Understanding this dynamic is one of the most important concepts a trader/investor can grasp (especially in today’s world). So let’s start with exactly what central banks do when they “manipulate” markets. The Fed has three blunt-force policy tools in its arsenal to help carry out its (ridiculous) dual-mandate of “maximizing employment” and “stabilizing prices”. The reserve requirement is the amount of cash a bank needs to hold against the money deposited to it. By raising or lowering the reserve requirement, the Fed affects the amount of capital that banks can deploy (lend out). Lowering the requirement expands liquidity and raising it contracts liquidity. The discount rate (also known as the overnight rate) is the interest rate banks pay on short-term loans borrowed from the federal reserve. This rate affects all other rates (think mortgage, credit card, business loans etc). And just like the reserve requirement, when the discount rate is lowered, money (liquidity) is boosted. These two tools are the most commonly used since they’re what the Fed uses to “manage” the normal business cycle. The third tool, open market operations (also called QE), is used more sparingly. It only becomes necessary at large secular turning points in the debt cycle. We’re at one of those points now. During these times, the discount rate can’t be lowered any further, it’s at zero or negative. So the Fed (or any central bank) creates money (adds digital zeros to its balance sheet) and buys securities such as government bonds from banks. The hope is that banks will take the money they receive from selling their bonds and buy more assets. The increased demand for assets should drive interest rates lower and stock prices higher. This is the intended “wealth effect” you’ve probably heard economists talk about. But how exactly does this boost markets… and more importantly… can the Fed use this method to prop up markets forever? We’ll start with the “how” first. The difference in expected returns between asset classes creates risk premia. And it’s the difference in risk premia that forms the financial spreads that comprise markets. This risk premium spread is one of the largest drivers of bull and bear markets… so it’s very important to understand. We can break down risk premium by asset class. Cash is (generally) the safest of all assets. It’s fungible and not very volatile; it carries little risk. Since it’s perceived risk is small, the return on cash and cash like instruments is minimal… it offers little risk premium. Treasuries have a higher risk premium than cash because they’re subject to duration and inflation risks. This higher risk premium is what compels investors to exchange dollars for treasuries. The same goes for corporate debt, high-yield, real estate, and equities. The larger the spread between assets, the more investors are compensated for assuming greater risk (ie, selling bonds to buy equities). Different risk premia are easily visible in the historical return profiles of the three main asset classes shown below. While cash holders have hardly any volatility, they also get very little return. And equity holders get the highest return over the long haul, but they also experience the highest volatility — with the occasional extreme drawdown. Now the whole point of investing is to deploy your capital in a way that best maximizes your risk premium coupon to fit your needs and risk tolerance. This generally results in investors resorting to some kind of asset mix, where they diversify their risk and aim for an average return. This is where central banks step in. They “manipulate” markets by using their three policy tools to drive short and long term interest rates lower. This change in rates screws with investors’ asset mixes and investing decisions. The central bank essentially widens the risk premium spread by pulling rates on safe assets lower — creating a greater gap between safe and risk assets. 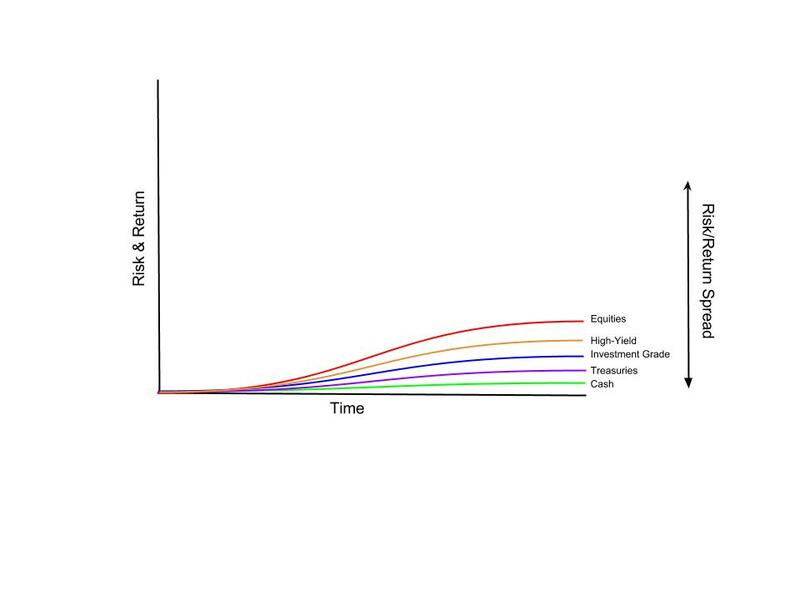 Since investors are compensated less for holding safe assets (bonds), they’re forced to reach further out on the risk curve to make up for it. But if bonds are manipulated to offer lower returns, investors are forced to bid up high-yield, real estate, and equities to capture that difference in risk premium. This causes the valuations of these risk assets to rise. People pay more and more for future cash flows. Markets rally and everybody wins… just kidding. Here’s the thing, the spread is not static. The risk premium is always changing. Sometimes the spread is wide and sometimes it’s tight. And the longer the central bank keeps rates low, the tighter and tighter the spread gets as investors flood into risk assets and push expected returns lower. Eventually it begins to look something like this. And here lies the answer to one of our original questions as to why a central bank couldn’t just perpetually prop up markets. 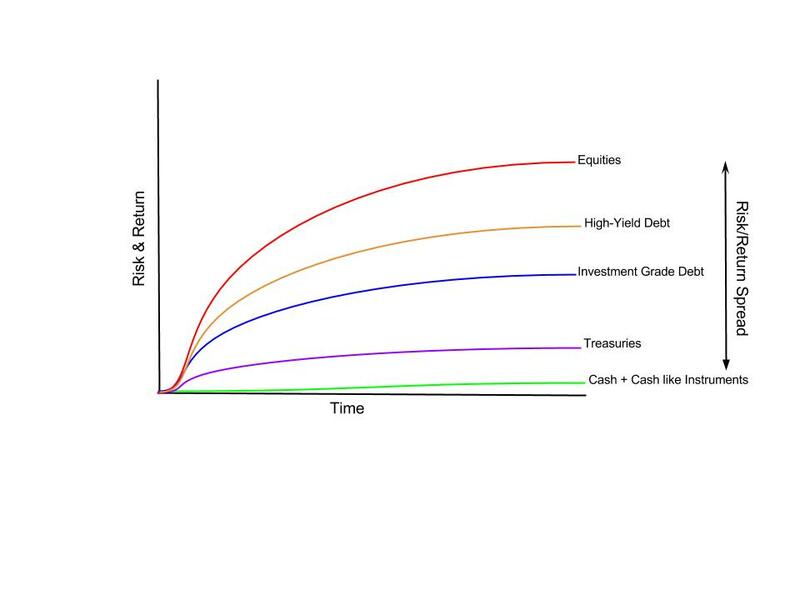 The reason is, that in time, spreads become so tight that the future expected return of risk assets is barely above that of just holding cash. At that point there’s absolutely no incentive for investors to exchange cash (a safe asset) for stock (a risky one). It becomes a losing proposition. We’re at this point now. These people are going to get steam-rolled over the next decade… it’s practically assured. So, to answer the second question — Does the Fed manipulate markets?… Yes, of course. But they always have. It’s in their mandate. We cannot genuinely criticize them now when we were cheering them on in the 80’s and 90’s. They’re the ones that gave us that indefatigable bull market. Those who’ve read our research on debt cycles understand that the Fed’s current policies are as predictable as cold weather in Boston, on a December day. The US market is not a buy and hold market right now… and won’t be until it corrects 50%+. It’s a traders market, filled with smart momentum chasers, but also greater fools. Don’t let that “greater fool” be you. For more on the Federal Reserve, check out the video below!